A collaboration by John Dowell, with choreographer and director Kareem B. Goodwin. A collaboration by John Dowell, with choreographer and director Kareem B. Goodwin. Assisted by Channel Kane, featuring SUNY Oneonta Dancers. Sound by John Dowell and Kareem B. Goodwin. Performed in the Martin-Mullen Art Gallery, January 25, 2018, in conjunction with the exhibition COTTON, by John Dowell. Dancers: Sabrina Noti, Nicole Catapano, Meghan Cassidy, Amanda Murphy, Alexandra Gardner, Abigail Haviland, Jenna Snide, and Sezlyn Petersen. Here I am lecturing on the relationship between music and printmaking for me. Enjoy! 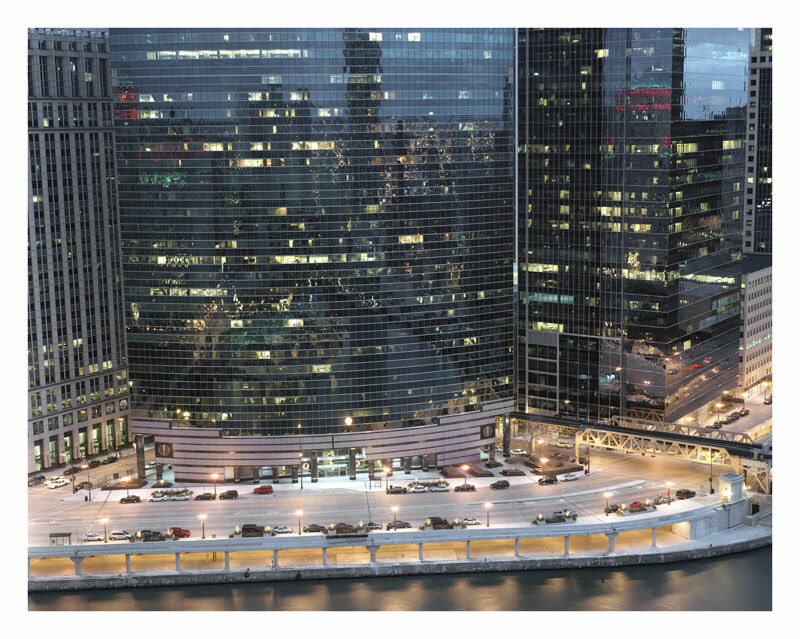 My photograph “Wacker Drive” is part of the upcoming exhibition, “Photographs Are Ideas: Selections from the LUAG Teaching Museum Collection” at the Zoellner Art Center, Lehigh University. A solo exhibition of my cotton work is on display now through March at SUNY Oneonta. ONEONTA, N.Y. — A new exhibit, titled Cotton: The soft dangerous beauty of the past, explores both the beauty of cotton and how it prolonged slavery in the U.S., and is being featured from January 22 to March 16 at SUNY Oneonta’s Martin-Mullen Art Gallery. Photographer John E. Dowell, Jr., delivered a gallery talk during a public reception from 5-to-7 p.m. on Thursday Jan. 25, at the gallery, which was followed by a dance performance, “Cotton in Motion,” by choreographer Kareem Goodwin and SUNY students. 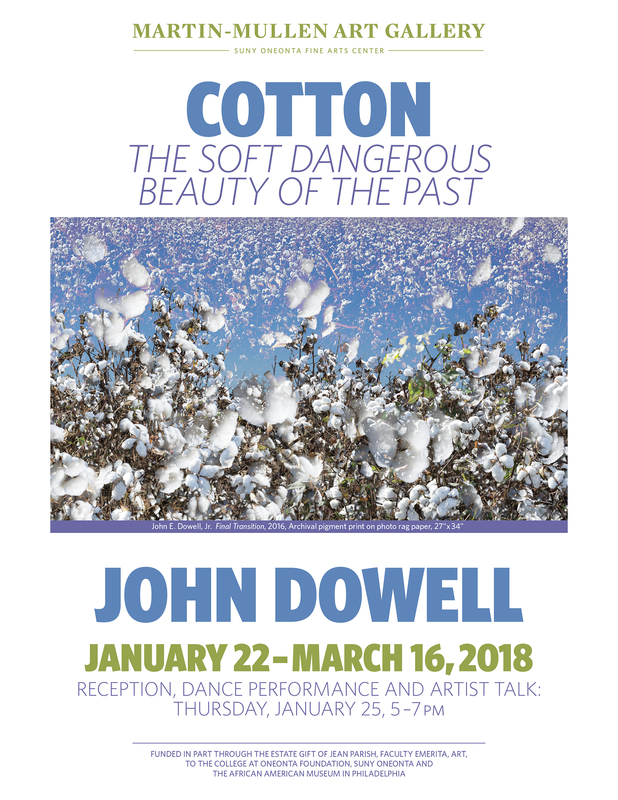 The cotton exhibit will allow visitors to experience how a four-year-old could get lost in a field of cotton, as the grandmother of Dowell did in South Carolina. They will be able to step inside what appears to be a cotton field. A maze of huge curtains printed with images of cotton hang from the ceiling. On nearby walls are seven monumental photographs of cotton, which range from the eight-foot long, “Breaking Away,” to the 13 foot-long, “Feeling the Pain.” Smaller photos from 27 inches to 34 inches high hang nearby. The second largest number of slaves in the United States were auctioned off in New York City. The official slave market opened in 1711 and was located on Wall Street between Pearl and Waters Streets. By 1730, 42 percent of New York city population owned slaves. Much of this history has been forgotten. Dowell has built photographic images placing cotton on and around Wall and Pearl Streets in New York City, and Central Park, where Seneca Village, the first U.S. middle-class black community existed. The housing community was leveled by use of eminent domain to make way for Central Park. I have put images cotton in Harlem as a symbolic reminder of our forgotten past and our responsibility to remember how our country was built. Dowell collaborated with Philadelphia choreographer Kareem Goodwin to create “Cotton in Motion,” a dance that introduces human movement and interaction with the cotton installation. SUNY Oneonta dance instructor, Shannah Kane, worked with Goodwin and the university’s dance students to stage the performance for the reception. As a performing artist, Goodwin has worked with such choreographers as Christopher L. Huggins, Louis Johnson, Ronen Koresh, Gary W. Jeter II, Zane Booker and Arthur Mitchell. He also has been a member of Eleone Connection, the Pre-Professional Company of Eleone Dance Theatre. He is on the faculty at Eleone Dance Unlimited and the Dance Institute of Philadelphia, and he serves as a guest faculty member at the Rock School of Dance Education. In early 2017, Goodwin was selected as the inaugural recipient of the New Voices of Dance Award presented by Dissonance Dance Theater in Washington, D.C. He is also an NAACP ACT-SO Local and Regional Gold Medalist, as well as a National Finalist. 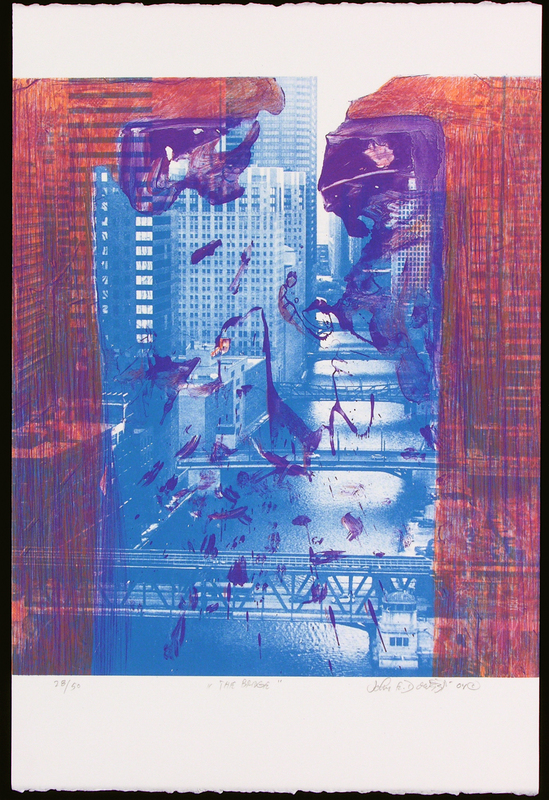 Dowell is a nationally recognized artist, master-printer and photographer. For more than four decades, Dowell’s fine art prints, paintings and photographs have been featured in more than 50 one-person exhibitions and represented in the permanent collections of 70 museums and public collections, including the Museum of Modern Art and the Metropolitan Museum of Art in New York City, the Museum of Fine Arts in Boston, the San Francisco Museum of Modern Art and the Bibliothèque Nationale in Paris, France. Dowell’s photographs are in the Houston Museum of Fine Arts and have been added to his work in the collections of the Fogg Museum of Harvard University, the Museum of the Rhode Island School of Design and the Lehigh University Museum. He captures the pulse of cities and agricultural landscapes of America in his large-scale photographs. Working primarily from sunset until dawn, he focuses on the surface of buildings, the reflections of their exteriors and, quietly, their interior spaces. By illuminating the unseen, he brings awareness to a single moment. This exhibit and dance performance are funded, in part, through the estate gift of Jean Parish, faculty emerita, Art, to the College at Oneonta Foundation, and, in part, by the African American Museum in Philadelphia.